This spring semester, the second-year architectural design studio (ARCH 202) is collaborating with Reiman Gardens to participate in a kinetic art exhibition, “Forces of Nature,” on display April through October 2018. Internationally-recognized kinetic artist George Sherwood will headline the exhibition with his wind- and light-activated sculptures displayed throughout the garden. 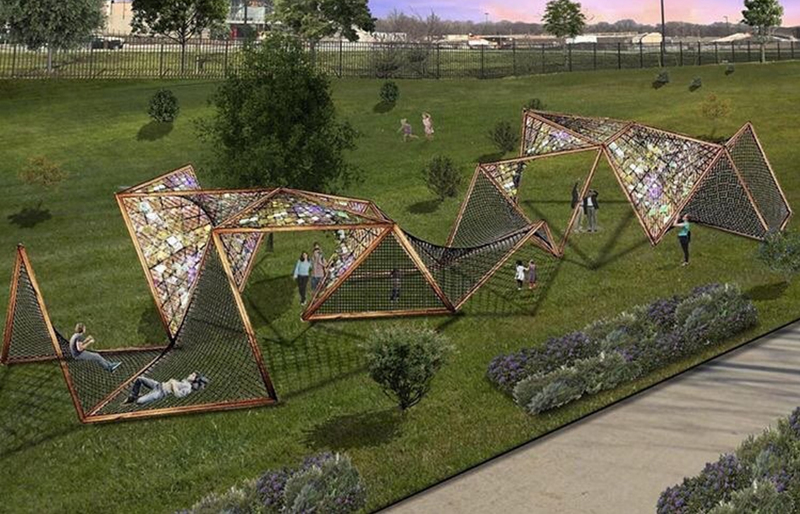 As a companion piece, the 77-student ARCH 202 studio designed a 1,300-square-foot outdoor structure, “PRISMA,” that incorporates playful interaction with woven hammocks, climbing nets and wind-driven, spinning iridescent panels. The project’s tumbling forms are inspired by the plants, animal life and natural forces on the site and developed over several weeks of consultation with Reiman Gardens. The goals for the studio are to introduce students to the experiences of design-build — developing skills in design, documentation, construction and teamwork — in addition to public outreach and engagement with the community. At the same time, the spring 2018 studio expands the ambit of second-year architecture design-build projects to include moving components, multiple materials with high-quality finishes, and the exploration of computation and construction through digital fabrication for full-scale production. ARCH 202 instructors include lecturers Roman Chikerinets, Reinaldo Correa, Leslie Forehand and Ayo Iyanalu and assistant professor Nick Senske. ARCH 202 students include Robert Agnes, Tikeoluwa Akintan, Mohammed Alhamoudi, Dylan Anderson, James Arnold, Brett Biwer, Jay Borgman, Kelsey Buenz, Donovan Bunn, Madison Cardenas, Ruoxi Chen, Vyankatesh Chinchalkar, Sarah Cobb, Braden Cooper, Deysy Cruz-Escobar, Zachary Detterman, Danica Dewit, Thien Doan, Leigha Duckett, Diandra Duenser, Andrew Evans, Oluwatobiloba Fagbule, Lauren Fordyce, Samantha Frantik, Cassandra Frazier, Jacob Gasper, Jacob Gockel, Melanie Gray-Trier, Benjamin Hansen, Abbigail Harding, Elisabeth Hocamp, Carolan Hoffman, Hannah Hogan, Jordyn Holtmeyer, Emily Huston, Ariana Irizarry, Mary Kelly, Cyle King, Matthew Koepke, Hannah Larsen, Tuyen Le, Mary Le, Henry Melendrez, Elizabeth Modra, Ahmed Mohamed, Allison Morgan, Robert Murrow, Ben Olsen, Grant Olson, Gautam Pradeep, Haiyang Qian, Jhonriel Ramirez, Terry Ritchie, Javier Rodriguez-Reyes, Nicholas Roose, Samuel Rushenberg, Heather Schulte, Tanya Sharma, Christopher Shoemaker, Brett Snyder, Nicholas Stenslie, Lauren Stokes, Samantha Stumpner, Caleb Sturtz, Nolan Sullivan, Jennifer Tan, Yee Chuen Teoh, Mia Tiric, Jaya Tolefree, Noah Tornabane, Noah Torstenson, Alice Tosi, Mathew Townsley, Trevor Toy, Emma Vanzante, Haoyang Xin and Salvatore Zajac. See the studio’s Instagram account @ISUArch 202 to follow the project’s progress.